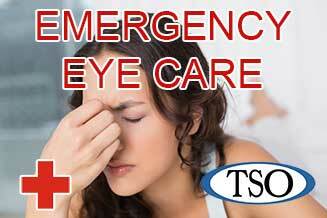 Please walk-in to TSO North Spring with red eyes, pink eye, or scratched eyes for immediate attention in Spring, TX. TSO North Spring specializes in Ortho-K lenses and Myopia Control for children & adults. Painless treatment & great results. 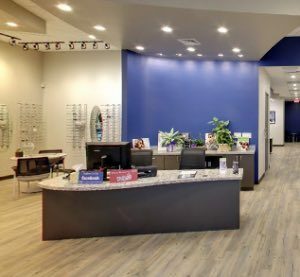 The TSO Tomball eye doctor believes in looking at the big picture when it comes to your eye health, so we take the time to get to know you, your eye care history and your vision needs. Dr. Roof knows that getting the right prescription involves balancing several factors, including clear eyesight, visual efficiency and your ability to process visual information seamlessly. Whether you need a routine eye exam, an eyeglasses fitting or treatment for eye disease (such as glaucoma or macular degeneration) or eye surgery (such as LASIK or cataract surgery), our Tomball optometrist will provide you with the best care, advice, options and follow up. 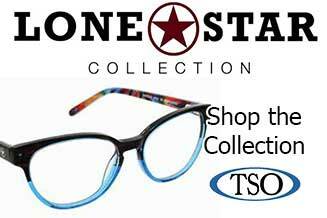 Our Tomball eye care center optical carries a wide selection of eyeglasses and frames for every budget and style. Contact lens fittings and contact lenses are also available from our Tomball eye care clinic. I just brought my 11 month old in for his first eye exam and we had a really wonderful experience. Dr. Roof was great with my son; you can tell he has kids of his own. He was very knowledgeable and answered all my questions, and he really took his time with us, which I really appreciated. And the receptionist, CC, was super sweet. I will highly recommend them to all my friends, especially those with little ones. Dr. Roof is always a treat to visit! Always honest and funny! Marcielle and Cece are very friendly and ready to assist in picking out great frames! Cant wait til our next eye exam! Great place to get your family's eyes taken care of. Marcel is wonderful and has helped us find the right glasses and prescription. Dr. Roof is an expert as well! The entire team is fantastic, knowledgeable and professional. Love this place! Wonderful atmosphere! I’m so glad I came across this place when looking for a new doctor. This place is great! They treat you like family and go the extra mile in every way. Dr Roof is patient and thorough, and very kind. Marcel is amazing! She was meticulous in shaping and fitting my glasses (I have a big head, getting glasses that fit eluded me until this place). My nose piece came off almost a year later (my fault) and she fixed them on the spot, no charge. If you haven’t found someone great to help with your eyesight, this is your place! We have been coming here since they opened. Dr. Roof is so good with my kids and knows what he is doing. Marcel is so knowledgeable and helpful. The experience is always pleasant and they want to help. Customer service is high priority and it’s worth the drive! Tomball eye doctor, advanced eye exam and fashionable eyewear. 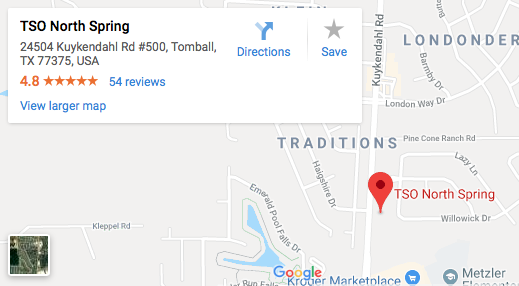 The Tomball Eye Care Center is Conveniently located on 24504 Kuykendahl Drive, Tomball. TSO North Spring’s office is open 5 days a week. Call our eye clinic to make an appointment with our Tomball eye doctors to talk about your eyeglasses, contact lenses or specialty lens needs. Or just drop in anytime to browse through our large selection of designer eyeglass frames or sunglasses. Our purpose is to serve you and help you see the important things in life. We use the Icare tonometer in our glaucoma screening, so NO AIR PUFFS EVER! We are easily accessible for residents of Spring, The Augusta Pines, and Tomball. Should I wear sunglasses in wintertime? With Christmas coming up, winter is just starting to kick in here in Tomball. The winter solstice is just around the corner, December 22nd. This is a great time to consider whether sunglasses are still necessary, just in time for a last minute gift if you are still looking. Sunglasses are important no matter what time of year it is. There are two main forms of sunglasses; those with only tint or color and those with a polarized filter inside the lens. Tinted sunglasses are what you find on most fashion sunglasses and the cheap ones you find at the grocery store and gas station. They only make it less bright, and unless they specifically say so, the do not always block UVA and UVB radiation. Polarized sunglasses, like those you find in an optical, not only dim the light but they also block out certain wavelengths of light. They not only make it more comfortable to see by making it less bright, they also reduce the glare and reflections especially when driving. Although more expensive, polarized sunglasses are well worth the cost, and are what I recommend to my patients, as well as what I wear and my family wears.